The Gem and Jewelry Institute of Thailand’s library has been developed as a self-learning center of gem and jewelry. It is considered one of the most comprehensive technical libraries in Thailand. 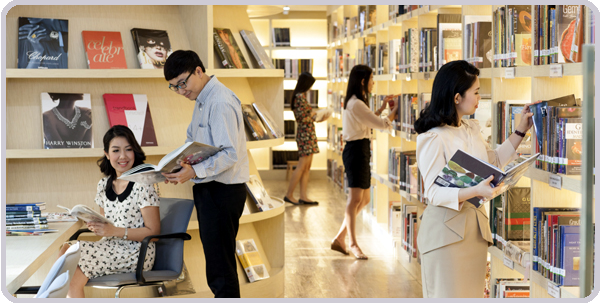 Since opening in 2002, the library has attracted numerous visitors and rendered service to entrepreneurs, designers and students from both Thailand and around the world. Today the GIT library collection houses nearly 10,000 items about gem and jewelry, including books, magazines and DVDs relating to gemology, mineralogy, metallurgy, jewelry manufacturing, design and marketing. Research papers and electronic media are also available. A large percentage of the world's gem and jewelry magazines can be found at the library. Information service, i.e. books, journals, magazines, printed matters and electronic media regarding gems, jewelry & minerals from all over the world. Book and media preparation service via telephone. For fast and convenient information search, users can search for books or printed matters in their area of interest from the institute’s website and call the library’s staff to prepare the items in advance for rapid access on their arrival. Newly-arrived book and journal recommendation service on the library's webpage. Reproduction services. As a reference library, the GIT Library does not allow outsiders to borrow books or other materials. The library does, however, offer reproduction and picture scanning services for an extra fee. Academic papers regarding gem and jewelry markets of other countries, for example, as well as gem and jewelry trade regulations, published by the institute’s information center, are also available for sale at the library. Contact a librarian before using the library. Deposit bags and personal belongings in the lockers. Valuables should not be deposited with library staff and GIT takes no responsibility for loss or damage of valuables left by library patrons. Food, snacks and beverages are not allowed in the library. Do not make loud noises or commit any offence that may bother library patrons or staff. Photography is not allowed in the library without permission of the librarian. Silence your mobile phones while inside the library. No portable computers or electrical appliances are allowed to be plugged into the outlets in the library. Books or other library materials shall not be torn, cut, written on, damaged or destroyed in any way. Books or other library materials shall not be removed from the library without prior approval. Outsiders and other users are not allowed to borrow any kinds of information resources out of the library. Before leaving the library, personal property shall be inspected by the library's staff.